Sleeping at the airport may not be an ideal situation, but it doesn’t have to be a horrible experience either. In this post, we have 6 safety tips to ensure you and your belongings are secure and comfortable. Let’s be honest: sleeping at the airport isn’t the most ideal way to get some decent rest, now is it? No, it’s not. In fact, it’s hard to think of anyone in their right mind who would opt for sleeping in a terminal, waiting for their endless layover to end, rather than be snug as a bug on a rug in a warm and cozy bed that’s either at home or a hotel room. And yet…sleeping at an airport doesn’t have to be too hard, nor does it have to be unsafe. Obviously, being worried about one’s possessions is a huge concern to take into account when planning a spontaneous sleeping session in between flights. No one wants to lose their personal belongings just because they wanted to take a well-deserved nap in transit. But get this: You don’t have to. Sleeping in airports may sound risky and downright dangerous to some, but in reality, it’s not so bad. You can take preventive steps in ensuring the safekeeping of yourself and your carry-on items while you sneak in a bit of slumber before your seat is called. 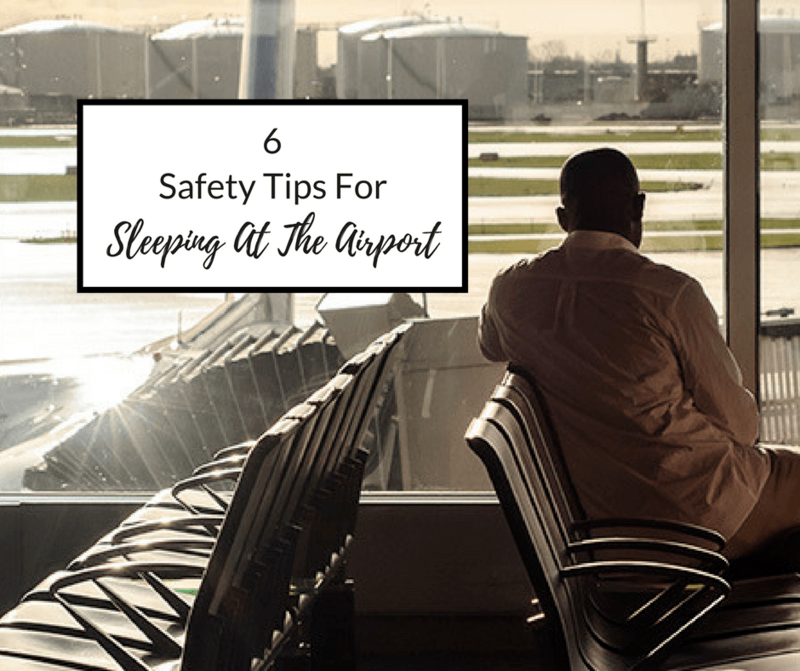 Without further ado, here are 6 safety tips for sleeping at the airport from Sleep Advisor team. Just to get this out of the way first: One easy way to make sure nobody runs off with your stuff is by using your bag or backpack as a pillow. Whether you place it under your head or hold onto it for dear life, your bag/backpack/suitcase stands a much higher chance of not being stolen if its held close to your person, even if you’re not conscious. If you’re looking for a place to squat and have some rest, you’re definitely not alone. It’s best to choose somewhere that’s near other like-minded travelers who are trying to count some sheep too. While you’re searching around the terminal trying to find the perfect sleep spot, look for any groups of flyers that have already made up a makeshift camp or a shanty town of sort that’s dedicated to sleep and sleep only. Hint: You’ll usually find these past security checkpoints in international airports or close to food court areas. If you take a nap with your temporary sleep community, you’ll be safe and good to go. Did you know that most airports have cots handy for stranded passengers to sleep on? Most of the time these are luxury items reserved strictly for events like heavy storms or mass flight cancellations. Airports typically do not bring cots out to accommodate travelers who are trying to save money. Sounds barbaric, right? Face it: That’s secretly the world we live in, folks. It’s not considered inhumane if it’s supporting the economy, right? So, most of the time, you probably won’t have a chance of getting one right away. But… if you ask the right attendant in the right way at exactly the right time, who knows what might happen. Just sayin’. Did you know that pay-per-use lounges aren’t just for first class passengers? Actually, they’re available for use for all travelers no matter what airline they’re flying with. The thing is, you still have to pay for it. Money talks, remember? If you’re experiencing a layover and you can’t find that small shanty town of sleepy vagabonds and can’t bribe an airport attendant to give you a semi-comfortable cot to sleep on, fear not. You can pay to relax and take a load off in the lounge. You’ll even be fed meals in some places. In our humble opinion, that’s worth every penny. Research online. Read reviews from other, braver passengers who’ve come before you seeking affordable and convenient sleep in the terminal you’re visiting. That way, you’ll know what to expect so you won’t be caught off guard or thrown for a loop with whatever happens during your, ahem, “extended stay” there. If you get the wrong impression in a certain place in the airport, then don’t sleep there. If it seems off to you, go camp out somewhere else. It’s that simple. Feeling safe is better than staying up worrying while you should be fast asleep, catching rest before your next flight to wherever it is that you’re headed. That’s the point of all this, right? We hope this list of suggestions on how to sleep more safely at airports the next time you don’t feel like splurging for a hotel room just to get a few hours of sleep. Remember: If you’re in doubt, just sleep close to a few like-minded folks in a designated area that feels safe and comfortable according to your own personal standards. Helpful information. One day I lost my bags with equipment, but the guards managed to find a thief. Oh yes, it can really be annoying, but when you have to spend time at the airport, it’s better to rest a bit. And you’re so right, it’s not that easy, you’re often too tired or too worried about your things etc. But I agree that lounges are a good idea. I was surprised few times, expecting it to be too expensive or restricted, but it turned out to be quite nice. It’s true that it’s not the best way to get a good night’s sleep but sometimes it just can’t be avoided, and it’s great to read some practical safety tips ahead of such an experience. I had no idea about the emergency cots, that’s good to know as for me, I suspect the most likely reason to overnight at the airport is a cancelled or heavily delayed flight! This is actually a good post. Sometimes, if you are going to multiple destinations, sleeping at airports will save you so much money. One reason why I don’t particularly like this is if I need to be well rested when I get to my next destination. I didn’t know they can give you a cot. Never really had the guts to ask. But this is good to keep in mind. Thanks for the tips! Great tips! I’ve not had to sleep at airports very often, but did once arrive into Iceland super early one morning, and had a 4 hour layover. I used my pack as a pillow and wrapped the straps of my handbag around me! You’re totally right about listening to your gut – wherever you’re travelling and whatever you are doing, you should listen to your gut! Thanks for these useful tips! Yes its good to stay where you feel safe and where you feel your things will not be stolen just in case you are stranded. And yes, we should always trust our gut feeling. I’m not sure how I’d feel sleeping at the airport – you are right, safety would be a good concern and actually I wasn’t sure if I was allowed! Using a bag as a pillow is a great tip, I do this at music festivals too so I’m really used to it. Hopefully I’ll never have to sleep in an airport, but good tips if I do!